Injection molded in engineered thermoplastics. Will not corrode, chip, or peel, not even under the most severe applications. One piece tank design - compact, durable, user-friendly solution. Lightweight and strong: weighs up to 60 percent less than metal interceptors. Can be installed in-floor, on-floor, or semi-recessed. Measurements: 16.2" long by 18.29" tall by 13.5" wide; 2" from top to pipe opening, 8.1" from pipe opening to base. 7 lbs G.P.M capacity. 14 lbs Grease capacity. Both ends accept no-hub adapters for steel or plastic. T-vent pipe included. C IAPMO compliant models: GT8-GT30; UPC compliant models: GT40-GT100. Brand: John Boos | Manufacturer: John Boos & Co.
Injection molded in engineered thermoplastics. Will not corrode, chip, or peel, not even under the most severe applications. One piece tank design - compact, durable, user-friendly solution. Lightweight and strong: weighs up to 60 percent less than metal interceptors. Can be installed in-floor, on-floor, or semi-recessed. Measurements: 20.5" long by 13.8" tall by 16" wide; 2.5" from top to pipe opening, 10.4" from pipe opening to base. 15 lbs G.P.M capacity. 30 lbs Grease capacity. Both ends accept no-hub adapters for steel or plastic. T-vent pipe included. C IAPMO compliant models: GT8-GT30; UPC compliant models: GT40-GT100. Injection molded in engineered thermoplastics. Will not corrode, chip, or peel, not even under the most severe applications. One piece tank design - compact, durable, user-friendly solution. Lightweight and strong: weighs up to 60 percent less than metal interceptors. Can be installed in-floor, on-floor, or semi-recessed. Measurements: 22.5" long by 15" tall by 16" wide; 3" from top to pipe opening, 11.5" from pipe opening to base. 20 lbs G.P.M capacity. 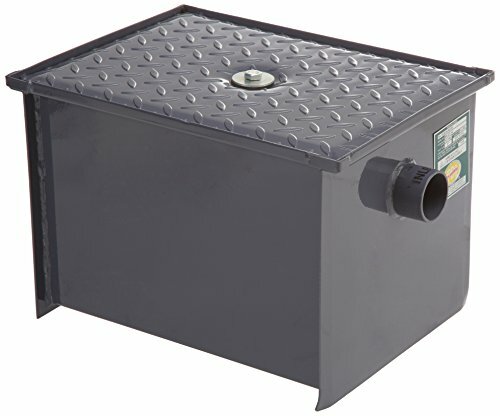 40 lbs Grease capacity. Both ends accept no-hub adapters for steel or plastic. T-vent pipe included. C IAPMO compliant models: GT8-GT30; UPC compliant models: GT40-GT100. 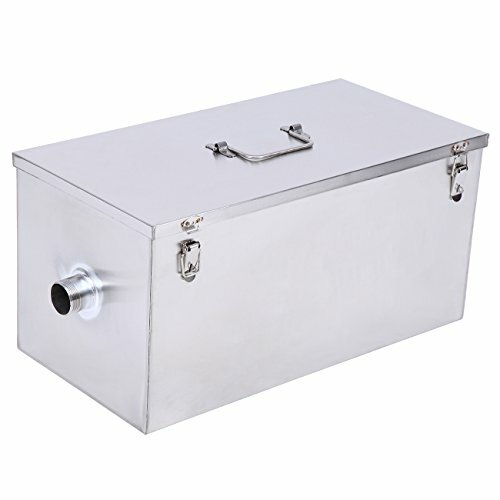 1 Grease traps work on the basic principal that FOG's (Fats, Oils & Grease) float on water and solid particles sink. 2 As the inflow of waste water from the sinks enters the grease trap the fats, oils and greases rise to the surface and is trapped between the baffle plates. 3 The baffles on the outlet prevents FOG's from flowing directly through the unit. 4 These FOG's are retained within the unit along with food particles and clean water flows under the baffle plates through the unit to drain. 5 The retained waste collected within the unit can be easily removed at regular intervals using the removable fine mesh filter. 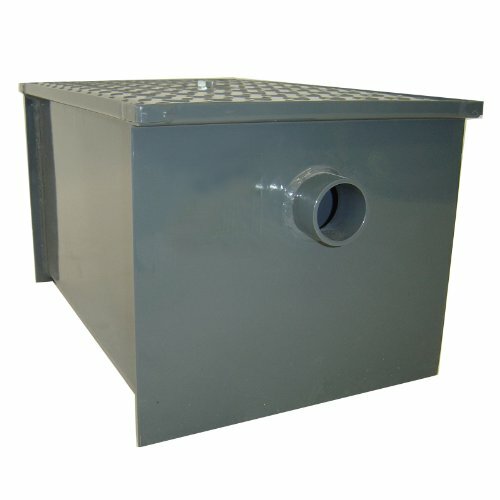 Installation: Our Grease Traps are delivered fully assembled and couldn't be easier to install. Just connect the pipe run from the sinks and dishwasher to the Grease Trap inlet.Then pipe the Grease Trap outlet directly to drain. We recommend solvent weld pipe is used for a secure fit. Also make sure the trap is on the flat floor. Injection molded in engineered thermoplastics. Will not corrode, chip, or peel, not even under the most severe applications. One piece tank design - compact, durable, user-friendly solution. Lightweight and strong: weighs up to 60 percent less than metal interceptors. Can be installed in-floor, on-floor, or semi-recessed. Measurements: 14.2" long by 11.29" tall by 10.5" wide; 2" from top to pipe opening, 8.1" from pipe opening to base. 4 lbs G.P.M capacity. 8 lbs Grease capacity. Both ends accept no-hub adapters for steel or plastic. T-vent pipe included. C IAPMO compliant models: GT8-GT30; UPC compliant models: GT40-GT100. 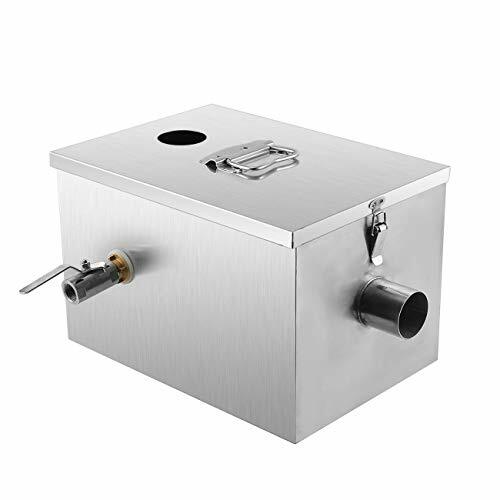 Zurn's GT2701low-profile fabricated steel grease interceptor is recommended for removing and retaining grease from wastewater in kitchen and restaurant areas where food is prepared. Ideal for applications under the sinks or in an area where space is limited. 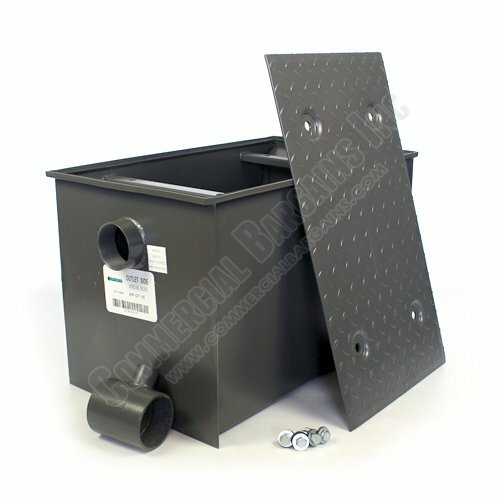 The GT2701 is corrosion-resistant, furnished with no-hub connections, flow diffusing baffle, integral trap and vented inlet flow control device. 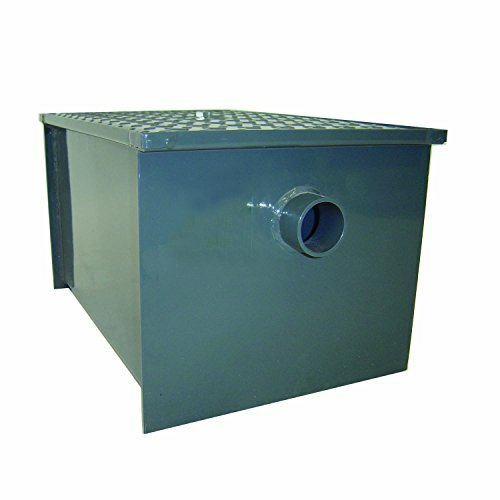 Corrosion-resistant coated fabricated steel with no-hub connections, slip-resistant, flow diffusing baffle, integral trap and vented inlet flow control device. 1. Both ends accept No-hub adapters for steel or plastic. 2. 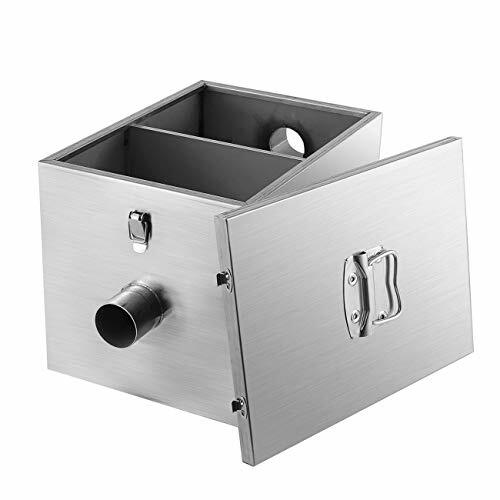 The buckle lock on the removable lid can hook up to the trap tightly, effectively prevent odor spilling. 3. 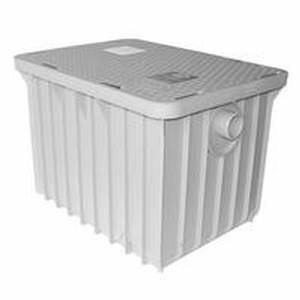 With the filter basket, the retained waste collected within the trap can be easily removed at regular intervals. 4. 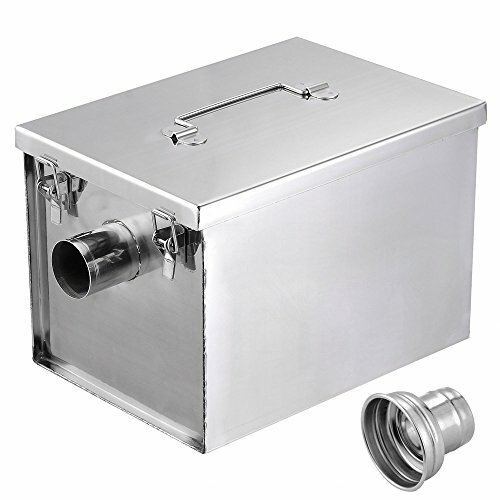 Smooth stainless steel grease trap edges inside and outside, do not worry about slitting your fingers when cleaning this trap. 5. 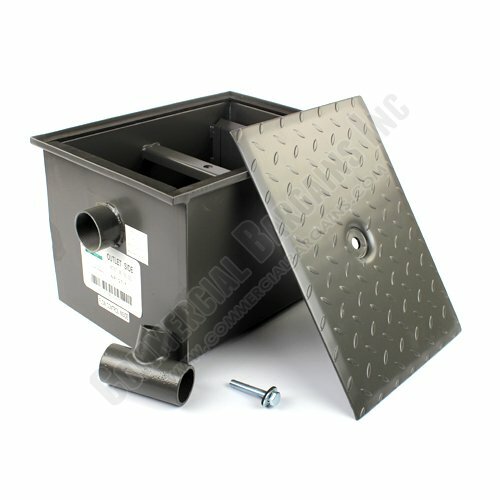 This trap can prevent clogging of sewers, avoid the breeding of rodents caused by rotting grease, odor spills and extend the service life of sewers. Just connect the pipe run from the sinks and dishwasher to the Grease Trap inlet. Then pipe the Grease Trap outlet directly to drain. 1. One week after installation, check the grease level inside the interceptor. These results should be used to determine the appropriate cleaning schedule to be used for future cleaning. 2. To clean, simply remove the lid and then extract or skim the grease into an empty container. replace the lid and secure the retaining bolt. One piece tank design, lightweight and compact, can eliminates seams and withstand continuous discharge. Threaded pipe included, and it is closely fit with this grease trap to prevent potential leaking. 2 inch connection size inlet and outlet. Great for kitchen, restaurant, factory, school or small sink or dishwasher application. 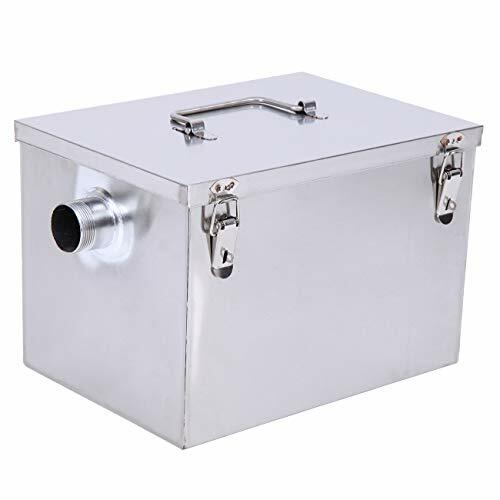 The grease trap is made of heavy duty stainless steel, strong and durable, will not corrode, chip, or peel, not even under the most severe applications. 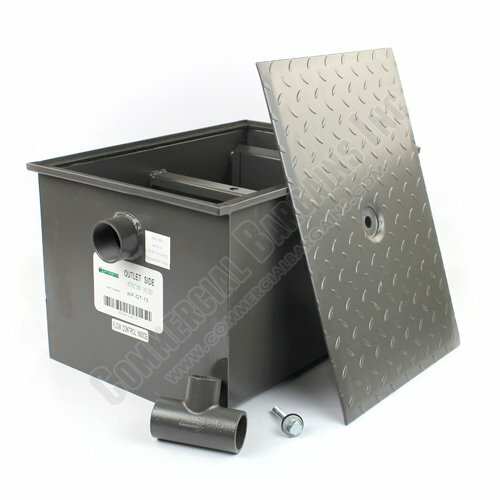 The trap can be installed in different places, in-floor, on-floor, or semi-recessed. Removable lid for easy maintenance and clean out. Constructed of 11 gauge carbon steel w/ corrosion resistant coating. T-vent for proper air venting is included. Designed for removing fat, oil and grease from waste water. Main body suspended from floor to avoid corrosion. 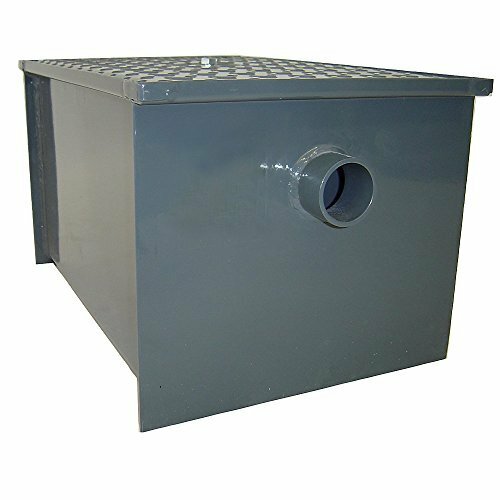 Specifications: 25 lb Grease Trap- 13 Gallons Per Minute (G.P.M.) 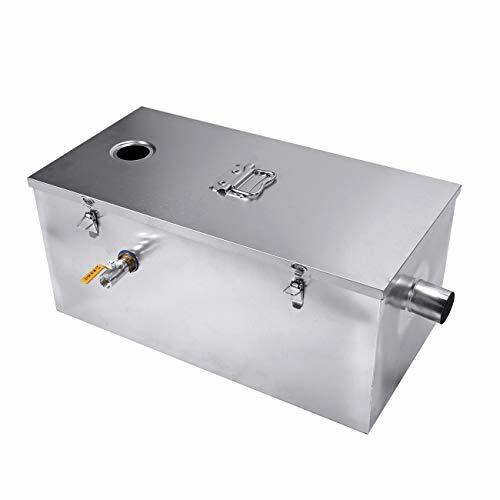 Material: Heavy Duty 1.2mm Thickness 201 Stainless Steel Removable Baffles for Ease of Maintenance Cover locking device Overall dimensions: 24" x 12" x 11"(L*W*H) Connection size(Inlet & Oulet): 2"
Installation: BEAMNOVA Grease Traps are delivered fully assembled and couldn't be easier to install. Just connect the pipe run from the sinks and dishwasher to the Grease Trap inlet.Then pipe the Grease Trap outlet directly to drain. We recommend solvent weld pipe is used for a secure fit. Also make sure the trap is on the flat floor. 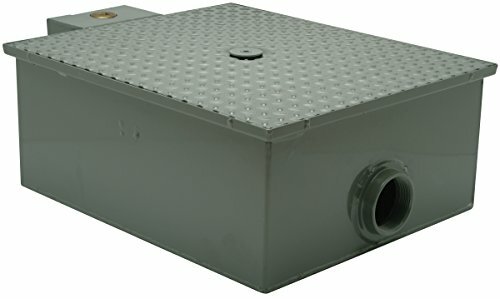 How it works: Grease traps work on the basic principal that FOG's (Fats, Oils & Grease) float on water and solid particles sink. As the inflow of waste water from the sinks enters the grease trap the fats, oils and greases rise to the surface and is trapped between the baffle plates. The baffles on the outlet prevents FOG's from flowing directly through the unit. These FOG's are retained within the unit along with food particles and clean water flows under the baffle plates through the unit to drain. The retained waste collected within the unit can be easily removed at regular intervals using the removable fine mesh filter. 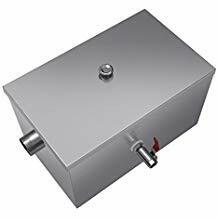 HOW IT WORKS - Grease traps work on the basic principal that FOG's (Fats, oils & grease) float on water and solid particles sink. As the inflow of waste water from the sinks enters the grease trap the fats, oils and greases rise to the surface and is trapped between the baffle plates. The baffles on the outlet prevents FOG's from flowing directly through the unit. These FOG's are retained within the unit along with food particles and clean water flows under the baffle plates through the unit to drain. The retained waste collected within the unit can be easily removed at regular intervals using the removable fine mesh filter. 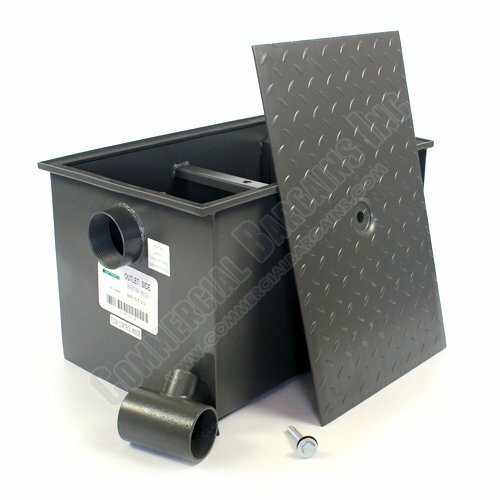 EASY TO INSTALL - BEAMNOVA Grease Traps are delivered fully assembled and couldn't be easier to install. Just connect the pipe run from the sinks and dishwasher to the Grease Trap inlet.Then pipe the Grease Trap outlet directly to drain. We recommend solvent weld pipe is used for a secure fit. Also make sure the trap is on the flat floor. PRACTICAL DESIGN - Overall dimensions: 24 x 12 x 11(L*W*H). Connection size(inlet & oulet): 2. Baffles are removable and easy to clean. Locking device at both side prevent side leakage of sewage. Faucet switch makes it easier to control the outlet of sewage. Lifting handle at the top allows easy transportation. One week after installation, check the grease level inside the interceptor. These results should be used to determine the appropriate cleaning schedule to be used for future cleaning.